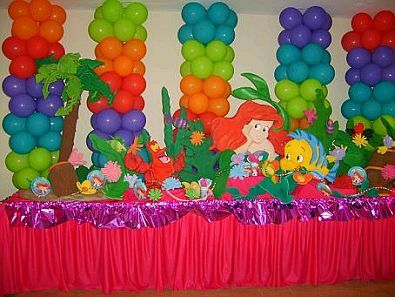 Ariel or The Little Mermaid is one of the favorite characters of kids, so if your birthday is near and yet decide not a decorating theme, this would be a good idea, decorate using the characters from The Little Mermaid, you can achieve great results thanks to the variety that exists. 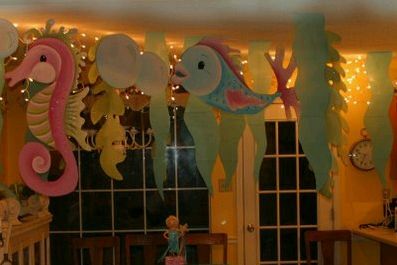 Here are some decorating ideas that will be useful. 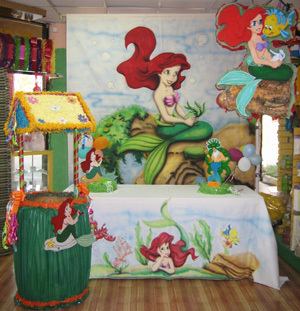 This first proposal recreates the ocean bottom, place in which the story takes place, simply use the right tablecloth, this simulates waves, and place the characters on the table before her. Peculiar decorating idea, made from ribbons and fishing nets, including fish are placed in rows. 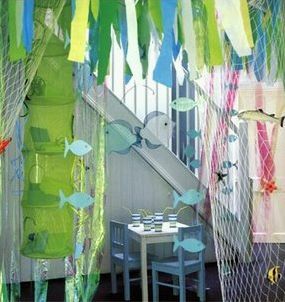 But if you prefer, you can decorate the ceiling of the room hanging from it, marine animals and plants, including the colored lights are also very good. Also very good idea to place a poster, or panel giant poster in the back and ahead decorate the head table. 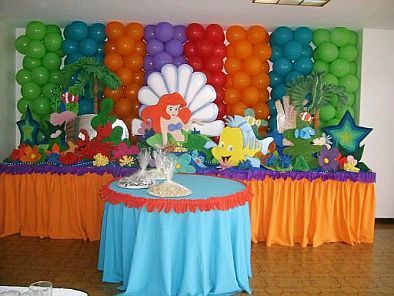 If you prefer to decorate with balloons, here we give you an idea, these columns of colored balloons and head table on which are placed the Little Mermaid with all her friends. This is another proposal, also based on balloons, it is a light blue and blue background and front figure of The Little Mermaid and friends, on the table can also be placed marine animals and plants. Colorful balloons proposal multicolored columns and a table with the Little Mermaid and her marine friends. 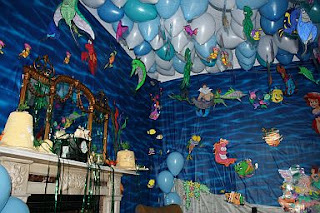 But if you want to impress friends and strangers, you can do with lights, illuminating the walls that resemble sea water, placing balloons on the ceiling, and hanging marine animals, of course, inevitable, the Little Mermaid, in the middle. 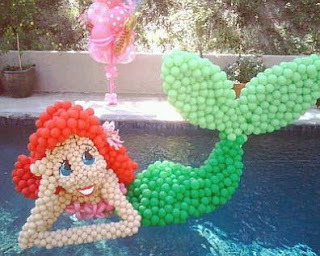 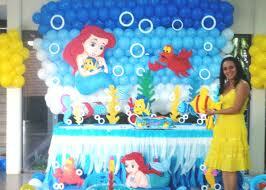 If at the place of celebration you to have a pool or a water source, place a Mermaid made from balloons, looks good. 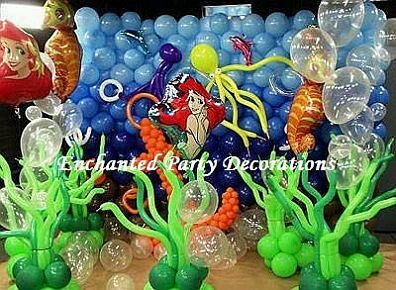 Another decorating idea made entirely on the basis of balloons, round, long, metal, if you pay attention you will notice that all the figures are made with balloons, and of course, amid a large metal globe Little Mermaid. 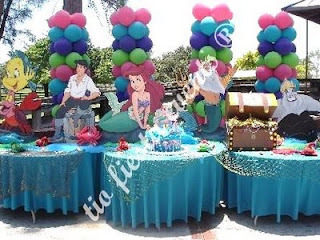 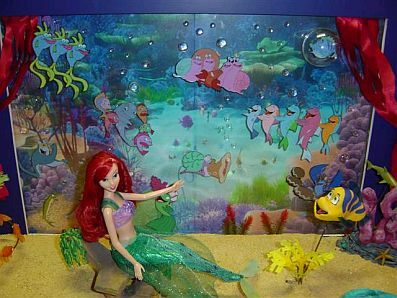 In this other proposal have columns of multicolored balloons and image of the Little Mermaid in the middle of the other characters in the film, it is also a good idea to place a chest of treasures and fishing nets. 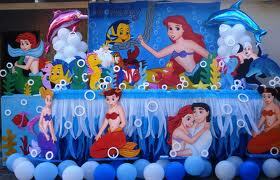 Finally, choose the right image and set it as background panel, ensures the success of a good decoration.